Katya Nosova is 16 and wants to be an artist. Her parents Sasha (left) and Lesya (right) hope to send her to a private art institute in Kyiv. Katya is growing up in Borodyanka, Ukraine, where many Chernobyl evacuees were resettled. American photographer Michael Forster Rothbart recently spent two years in and around Chernobyl in Ukraine to show that life in the area goes on despite the catastrophe at the Soviet-built nuclear power plant there 25 years ago. His work is on display in New York City alongside a children’s art exhibit related to Chernobyl. Chernobyl, April 1986: a helicopter flies over the doomed reactor. Fast forward 25 years: like a phoenix rising from the ashes of the plant, a little boy is tossed in the air by his father whose family now lives in a nearby town. The image is from a series of photos taken by Michael Forster Rothbart who spent two years on a Fulbright scholarship documenting life today in areas irradiated by the disaster. "Life goes on in Chernobyl. People meet and fall in love and get married and have children and raise the next generation. I really wanted to emphasize that it’s not all doom and gloom in Chernobyl. It’s like life anywhere. There is suffering as well as hope," he said. Forster Rothbart's photos are exhibited in two New York venues, the Ukrainian Museum and the Ukrainian Institute of America. An estimated 400 mostly elderly people have returned to the 30-kilometer exclusion zone around the power station. Some 3,800 people work in the zone. Tens of thousands live in areas just outside, in areas of elevated radiation levels. Dovetailing with Forster Rothbart's images at the Ukrainian Museum is an exhibit of drawings by Ukrainian children about an angel who had only one wing; the result of a mutation caused by Chernobyl. He could fly in heaven with no gravity. But on Earth, the angel had a problem. The story has a positive message similar to Forster Rothbart's. It is published along with the drawings in a book sponsored in part by a New Jersey Charity, the Children of Chornobyl (Ukrainian spelling of "Chernobyl") Relief and Development Fund. Founder Nadia Matkiwsky compares today’s children’s drawings with those in the immediate aftermath of the disaster. "There were flames that looked like devilish figures; distortions of people. And you see today, smiling faces, angels dancing around healthy children because this is how the present generation in Ukraine envisions Chernobyl," she said. Recognizing the invisible, but real dangers of radiation, the exhibit asks visitors if they lived in Chernobyl, would they move? Rothbart says Ukrainians live there for various reasons, among them, lack of alternatives, a sense of duty and decent jobs. Another, he says, is a deeply felt connection to the land and to ancestors who lived there. 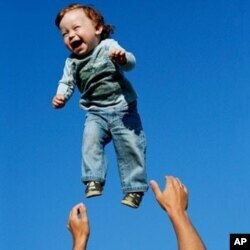 Andrei Balta throws his 15-month-old son Vanya in the air during a summer evening in Slavutych, Ukraine. Andrei and his wife Anna both work at the nearby Chernobyl Nuclear Power Plant, as do over 3,800 residents of Slavutych. Forster Rothbart says that for Americans, who are a highly mobile people, those ties are not as strong. "I grew up in Ann Arbor [Michigan], and if there was a nuclear accident next door, I would leave. I would miss the place, but I wouldn’t look back. But for people in Ukraine and Belarus, it’s those connections that are most important to them," he said. Forster Rothbart says he applies the lessons he learned at Chernobyl to Japan’s recent accident at the Fukushima Daiichi nuclear power plant. "Their lives will never be the same, from what I’ve seen in Chernobyl. They’ve evacuated. And even those that can go home will experience, as they say in Russian, 'radiophobia,' fear of radiation. Once the genie’s out of the bottle, you can never put it back in," he said. Forster Rothbart says Chernobyl today and perhaps Fukushima in 25 years are places where visiting photographers will find what they’re looking for. He found hope and resilience.